In light of these potential impacts we will phase out all active content on item pages beginning June 2017. After that time, listings that include active content may no longer render as expected, and buyer experience may be impaired. These benefits make it easier for buyers to view your items, which may increase the likelihood that they will purchase from you. In addition, by replacing or removing active content today, you ensure that buyers will continue to see text, images, and other elements included in your item description after June 2017. We recommend that you replace or remove the active content in your item description as soon as possible. For more information, please refer to our best practices guide for replacing active content at www.ebay.com/activecontent. Those who use third-party partners for templates or widgets should contact them to determine what is necessary. In June 2017, eBay will no longer render active content in any listings. Make sure to remove this feature so that it does not impair your buyers’ experiences when viewing your item descriptions. Check here to learn how to make your listings mobile–friendly. If you are a new Store subscriber, we highly recommend that you do not invest in any custom HTML Stores experience, as this will not be supported long–term. 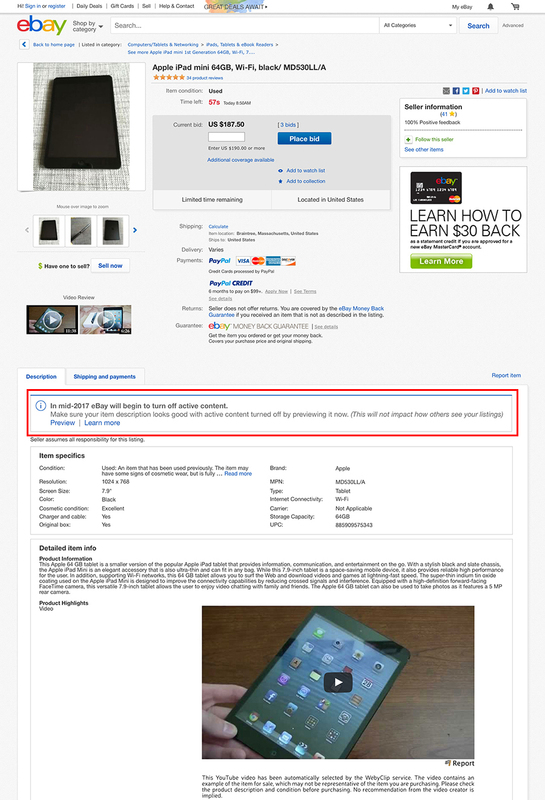 As an alternative, we suggest that you use the native eBay Stores experience. We will have more information for you regarding active content in Stores in early 2017. To see if you will be impacted by these changes, you can use our new item description preview tool. This will allow you to see what your description will look like when active content is not rendered. To use the tool, view your item page and click the preview option in the item description tab. This preview link is only visible to you, the seller. Buyers cannot see this option and previewing the item does not alter the description in any way. If you rely heavily on active content, we’ve developed a “how-to” guide with alternatives for you to use. In some cases, the alternative may already be available in our existing tools or in the standard View Item page. In other cases, we’ve provided example codes, demonstrating how to accomplish a similar task without using active content. eBay will limit, and eventually eliminate the use of active content in all new listings across all devices, and it will not be rendered by default. When will I no longer be able to use active content? Starting June 2017, active content will no longer load or be visible to buyers in your item descriptions. In an effort to improve the buyer experience on both mobile and desktop, we will be phasing out the use of active content on item description pages. It’s beneficial to limit your use of active content now for faster page loading, cleaner presentation across all devices, and to improve security in the marketplace. How do I know if my item description has active content? If you want to see what your listing will look like when active content is not rendered, sign in and use the preview link in your item description. Your preview will not impact what buyers currently see. We will be releasing further tools to help sellers identify and address active content issues in their listing descriptions and stores. How is active content used by third-party listings or shipping services in my item description or my eBay Store? Many tools and services include active content in features added to an item description or eBay Store, such as scrolling galleries, cross-merchandising widgets, drop-down menus, and search-box functionality. What does the term “no longer render” mean? Remove or replace all active content by using safer and more mobile-friendly techniques with HTML and CSS, or use existing built-in eBay capabilities. If you use a third party and they include features which use active content, know that we are working with them to transition to mobile–friendly, safe content wherever possible. We highly recommend that sellers discontinue any investment in a custom HTML Stores experience, since this option will not be supported long–term. We will provide additional information to let you know when active content will no longer be permitted in Store pages in 2017.